WITH A CHARM AND ATMOSPHERE ALL OF ITS OWN. Just 5 kms from Byron Bay’s seaside community, and with easy access via the Pacific Highway, you can be in town and back in minutes, returning to an exclusive enclave of luxury homes with a secluded rural feel. Lot sizes range from one acre to two and a half acres and beyond, with even larger rural lots available, all accessed via a paved road in a private cul-de-sac. And whether your dream home is for weekends or forever, you will be close to everything you need. You can get to the train station in 10 minutes, the local airport in 30 and there’s a medical centre, regional hospital and selection of schools within easy reach. There really isn’t anything like Byron Bay. And there’s no better place to enjoy it than Citriadora Rise. 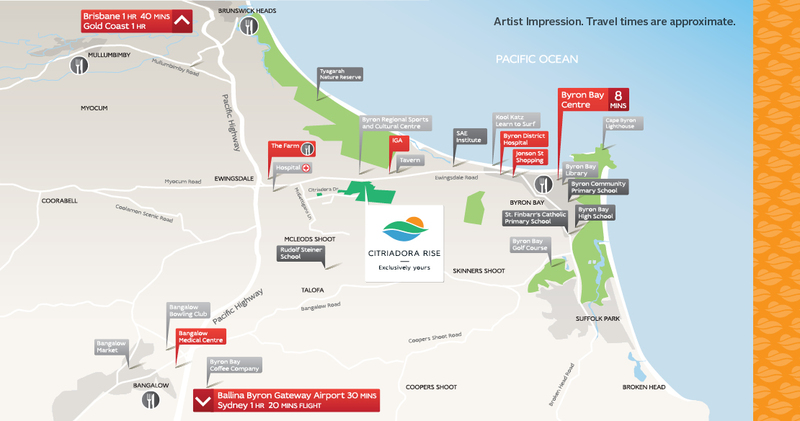 Citriadora Rise has now SOLD OUT – please visit the Intrapac Property site to view our other projects. Interested in finding out more about Citriadora Rise? Fill in your details below and we’ll be happy to give you a call!